Lovely handmade Turkish Village rug, bought by ourselves in Turkey, 20 years ago. TYPE: handwoven. woollen warp and weft. AGE: modern. SIZE: 2.60m x 1.83m - 8ft.6" x 6ft. THE RUG ATTIC. INDIVIDUALLY SELECTED RUGS. Beautiful hand made rug from Kayseriyun, Turkey. 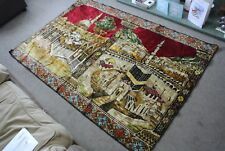 Purchased on holiday in Turkey and brought from the carpet factory and shipped to England. Just been professionally cleaned. Size 2.08 x 1.50 = 3.12 (metres). Only selling as changed decor'. No signs of wear, no threadbare patches, as often seen on some advertised . Genuine Turkish rug. VGC hardly been walked upon 11ft x 7ft 4 ins. 100 % HANDMADE TURKISH KARS WOOL ON WOOL ORIENTAL RUG HAS AN INTERESTING APPEARANCE INDEED, IT HAS A FABULOUS DESIGN WITH A CHARMING USE OF COLOURS. Mon – Sat 10 am – 6 pm. AGE IN YEARS. Rug Origin - Fine Turkish Konya rug is made with very fine lamb's wool on cotton foundation. The rug is in excellent condition with very pleasing colour and full pile. Hand washed and is ready for use or display. The process of creating these works of art begins by shearing to lower the pile and to help “distress” them. They then undergo a series of processes to remove the colour. A carpet can bring so much to any room whatever size and style. DECORATIVE TURKISH ANATOLIAN KURDISH KILIM KELIM FLATWEAVE LONG RUG. 173CM BY 91CM. WOOLLEN WEFT CONSTRUCTION WITH COTTON WARP THREADS. LATE 20TH CENTURY NORTH EASTERN TURKISH KURDISH FLAT WOVEN RUG OR SOUMAC FLOOR COVERING. PICS 10 TO 12 IS THE BACK OF IT. CONDITIONWISE; FLATWEAVE IS FRESH WITH NO HOLES,REPAIRS OR REWEAVES. VERY EXPENSIVE TO PRODUCE THESE HEREKE CARPETS. THIS ONE IS AN ATTRACTIVE MINT GREEN GROUND COLOUR WITH LATTICE HONEYCOMB TRELLIS DESIGN,PICS 1,5 AND 6. CARPET 18 YEARS OLD. HAS A VERY MINOR STAIN TO SELVEDGE EDGE,PIC 9. 107CM BY 66CM. SIZE EXCLUDING FRINGES. PICS 1 AND 2 SHOW YOU EACH END OF IT TO SHOW YOU HOW LIGHT AND PILE CHANGES THE COLOUR WHEN VIEWED FROM EACH END. 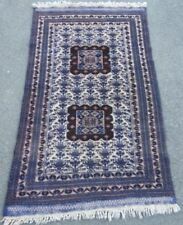 MADE IN TURKEY,MACHINE MADE TURKISH PRAYER RUG,FULL DETAILS ON LABEL.PIC 12. BEST TO TYPE ABRASH BANDS INTO GOOGLE FOR A DEFINITIVE ANSWER. SIZE EXCLUDING THE FRINGES BOTH ENDS. VERY GOOD QUALITY WOOL MACHINED ONTO A HESSIAN TYPE BASE. Lovely detailed hand made expensive Turkish rug signed by the maker. 98x78 cms in size. 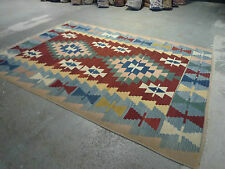 Anatolian Turkish Kilim Rug Hand Woven Natural Wool - 37' x 53"
ANATOLIAN TURKISH OLD KILIM RUG HANDWOVEN 100% WOOL. 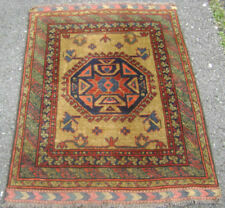 Hand made old Turkish Kilim rug using hand-spun 100% natural wool and natural vegetable dies. Very finely hand woven of all wool. I bought two of these capert but realised I only needed one. I like the feel and appearance of the carpet.It looks very majestic. The carpet can be vacuum cleaned. 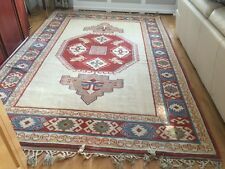 Hand Made Turkish Rug - Etrim Village 2.23m x 3.45m, bought as spare in July 17. 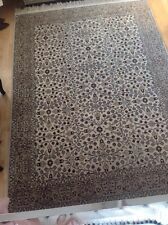 Etrum Village hand made rug bought in July as a spare. Original certificate available. Wool on wool, double knot. "This is an incredible Hereke pure natural Silk Persian Village rug. Silk Hereke Rare Village, Animals, Birds, Human. With itsRare design, andquality fine silk, this rug portrays an exquisite opulence. Size: 13'0" × 10'2" (396 × 310 cm). Size: 11'0" × 9'9" (335 × 297 cm). Size: 15'7" × 11'9" (475 × 358 cm). Size: 8'7" × 6'0" (262 × 183 cm) Artos - Turkish Modernist Kilim. Size: 10'7" × 9'0" (323 × 274 cm). It is woven of 100% polypropylene for both durability and comfort. This rug is machine-crafted in Turkey. Seafoam color rug suits a wide range of decor options. Stain-resistant rug for easy cleaning. Jute backing will keep it neatly in place. This runner is perfect to place at either the side of your bed or in your hall as an attractive accent piece. Stain-resistant fabrics keep it free of blemishes.